Have you ever updated to the newest version of WordPress, and then noticed that your site starts to have a bunch of problems? Don’t freak out. A lot of the times, it’s an issue with a plugin or theme that’s not compatible with the newest update. Sometimes (rarely) there’s an issue with the WordPress update itself. Whatever the case, one of of the quickest solutions to bring your site back to normal is to downgrade WordPress back to the previous version. Compatibility issues are one of the reasons I try to avoid plugins and themes that don’t get updated regularly. I don’t want to be stuck with an older version of WordPress just because one of my plugins or themes doesn’t work with the latest update. Before you go through the process of downgrading, I’d suggest checking to see if a plugin is what’s causing the issue. If it is, you can just disable the plugin until there’s an update for it. If it’s a problem with the theme though, that’s an entirely different story. That’s when you’ll want to consider downgrading your version of WordPress. Before you downgrade, I’d highly recommend making sure you have a backup of your site just in case things don’t go as planned and everything gets screwed up. I’ve never run into an issue but I always have the feeling that the one time I downgrade and my site goes berserk, I won’t have a backup. There are tons of backup plugins for WordPress and your web host might/should be able to provide you with the latest backup they have. The first thing you’re going to need is a previous WordPress release. You can download any of the previous WordPress versions here –> backup plugins for WordPress. Only downgrade down to the version before the newest one. Don’t go way back into the archives to version 1.1. Some of the older versions of WordPress have security issues that could put your site at risk. Here’s how to downgrade WordPress to an older version. After you’ve created a backup of your site and downloaded the WordPress version you want to downgrade to, it’s time to actually downgrade. The first thing you want to do is login to your WP Dashboard and deactivate all of your plugins. After all your plugins have been deactivated, logout of WordPress. This step will require that you have an FTP client. An FTP client allows you to access all of the files on your site. I use FireFTP from Firefox and FileZilla is another very popular option. Both are free and you can’t go wrong with either. The images in this tutorial are from FireFTP. 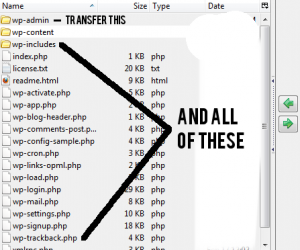 In your FTP client, locate your WordPress files (wp-admin, wp-content, etc.). In FireFTP, they will be the first thing you see when you open your site’s folder. 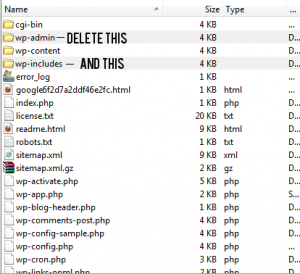 Delete both the wp-admin and wp-includes folders. Do not touch the wp-content folder! You can leave all of the other files alone because you will overwrite them in the next step. While you’re still in your FTP client, go into the folder where you have the WordPress version you want to downgrade to. Transfer over everything except the wp-content folder. After all the files have been transferred, your downgrade is finished. Login to your WP Dashboard. You will be prompted to update your WordPress database. 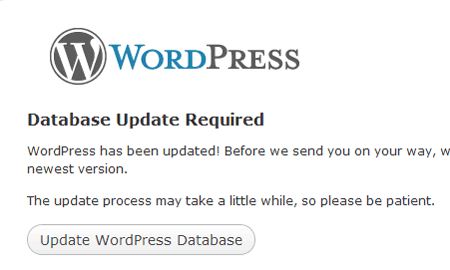 Click on “Update WordPress Database” and then click continue to login. Once you’re logged in, you should see that you’re running whatever version of WordPress that you downgraded to. Congrats! A word of caution. I don’t recommend using older versions of WordPress when newer ones are available. Like I said in the beginning, a lot of the updates come with security patches to stop known security threats that could leave your site open to hackers. If your theme isn’t compatible with the most current version of WordPress, contact the theme developer and let them know. If there’s no support offered for your theme, then you’ll want to switch to a different one that’s updated on a regular basis. The first four shortcodes are used for special WooCommerce pages and are sometimes automatically inserted into the pages by WooCommerce during installation. They should not otherwise be used. All others can be used throughout and can be used more than once. Shows the content of the cart page. Shows the content of the checkout page. Shows the user a form with which he can enquire about the status of his orders. Shows the content of the user account page. Shows the price and the “add to cart” button of a single product. Displays the URL of the “add to cart” button of a particular product in text form. Shows the detail page of a product. Shows the products in a category. Shows products with a particular attribute. Note: The parameters orderby and order are WordPress-specific and are described in more detail in the Codex. Shows the content of the cart page and everything that comes with it; list of products in the basket, voucher entry, shopping cart total, Proceed to checkout button, product recommendation etc. This shortcode will be automatically inserted into the cart page when installing WooCommerce. Shows the content of the checkout page and everything that comes with it; invoice details, order overview Continue button etc. This shortcode will be automatically inserted into the checkout page when installing WooCommerce. Shows the user a form with which he can enquire about the status of his orders by stating the order number and email address. After entering the data, the customer is redirected to a page that displays the status and a summary of the order. Shows the content of the My Account page and everything that comes with it; overview of past orders, billing address and delivery address etc. The customer can also edit his data here. This shortcode will be automatically inserted into the My Account page when installing WooCommerce. The customer whose My Account page is to be displayed. Number of orders to be displayed, -1 for the display of all orders. Shows recently added products, sorted according to various criteria. For presentation purposes you can specify the number of products to be displayed per page and the number of columns. Number of products displayed per page. Shows featured products, sorted according to various criteria. For presentation purposes you can specify the number of products to be displayed per page and the number of columns. Comparable to recent_products. Shows a single product that is specified by the ID or the item number (SKU). Make sure the catalog visibility is not set to hidden or the product will not be shown. The ID of a product can be determined in the dashboard on the product page. It will be displayed when you hover the mouse over the product in the name column. You can find the item number in the Art.-Nr. column. Displays several products, which are specified by their IDs or by their item number (SKU). Make sure the catalog visibility is not set to hidden or the product will not be shown. Comparable to product. Shows the price and the Add to Cart button of a product, which is specified by the ID or the item number (SKU). The style parameter can be used for formatting. Displays the URL of the add to cart button of a particular product in text form. The product is specified by the ID or the item number (SKU). Shows the detail page of a product which is specified by the ID or the item number. Shows the products in a category which are specified by their permalink (slug). You can find the permalink in the dashboard under Products → Categories in the column Permalink. Displays the product categories with the category image and if desired the number of products contained in each of the categories. Number of categories to be displayed. If null, then all are displayed. Specifies whether or not to display empty categories. 1 for yes, 0 for no. If set to 0, only top level categories will appear. The Ids of categories to be displayed. If not specified, all categories will be included. Shows the products that are currently on offer, sorted according to various criteria. For presentation purposes you can specify the number of products to be displayed per page and the number of columns. Shows best-selling products. The number of products displayed per page and the number of columns can be specified here. Shows top-rated products. Sorting according to various criteria possible. Shows products with a particular property and the specified values for that property. Sorting according to various criteria possible. The property that the products must have in order to be displayed. They will only appear if the parameter is used. The value of the property the products must possess in order to be displayed. Shows similar products. Similar products are determined on the basis of categories and tags. This shortcode must be used within a product detail page. Caution: The per_page parameter specifies how many items to display on a page. The pagination function is not automatically generated. The per_page and columns parameters determine how many products and columns will be displayed. Whether this actually works and for which parameter values, is highly dependent on the layout of your theme. This requires some trial and error and reworking of the CSS. The original documentation can be found on these WooThemes pages. Some shortcodes have been removed since WooCommerce 2.1.x. These shortcodes have not been described here. If required, you can also find them in the WooThemes documentation.